An ESAIL may start out slowly, but it could turn out to be the fastest man-made vehicle ever constructed. The European Union is funding a three-year project to build an ESAIL craft. The following video shows the basic deployment strategy and propulsion of the ESAIL. "How fast will this thing go?" the rigger wondered. "Depends on current density, orientation, and a bunch of other factors programmed into the RAM pins here." He flourished the goat-case, careful not to shake it. "If you're sailing large before the wind, your acceleration is about a thousandth of a gee." "That don' sound so fast, friend." Jimmy grinned, having said almost the same thing to Hobie last year. "Not compared to an SSTO main engine, right. Get a couple of gees squashing your bag during a lift, right? The sail gives a gentler push, but it keeps on pushing. You don't run out of fuel unless the sun goes out; in which case fuel is not your major concern. Bottom line is: a magsail can get you to Mars in about the same time it took the Mayflower to cross the Atlantic." 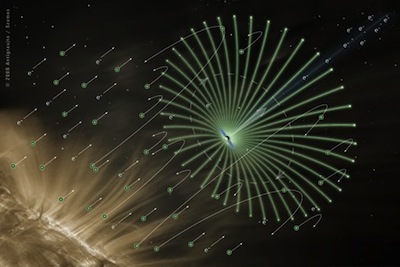 Via Electric Solar Wind Sail (E-sail); thanks to Jim Bowling for the tip and the reference.